John Montroll’s Starfish, from Animal Origami for the Enthusiast, has always been a favorite of mine; both because of the base that it employs (a five-sided preliminary fold) and because of the nice curving effect presented as a result of the folding process. I was playing with it a few days ago and noticed an interesting property: the crease pattern can be reduced to five side-triangles, as opposed to the customary four for a waterbomb base or preliminary fold. Upon reflection, I realize that this was quite obvious, but nonetheless, I was determined to do something with this model, to help me understand its structure and the process used to design it if not out of sheer curiosity. I shaded the finished base with a pencil, and then opened it out to see where these component triangles lay. Surprisingly enough, it was a logical arrangement on the outside of a pentagon, superimposed onto the framework of a square. This whole experience, of course, provided an interesting mathematical puzzle: If this could be done from four to five points, then why not from five to six? In case you haven’t guessed, the gray bits are unused paper on the edges, the green the collapsed paper in the center, and the blue is the actual triangles that make up the model itself. I wouldn’t be surprised if somebody’s already done this before, but it’s a neat little exercise in modulation nonetheless. I also tried this for eight points, but it didn’t work out as cleanly; there was too much extra paper sitting in the middle of the model to look very good. The crease pattern, for those who are wondering, was essentially built off of a blintz fold. Also, many thanks to Eileen Tan for putting me onto her RSS aggregator! If you don’t know about it already, I suggest checking it out; it saves you the time of having to check six or seven different blogs each day, and it follows lots of excellent blogs that I hope mine will someday equal. It’s at http://spinflipper.com/origami/feed.php. thanks for visiting my blog .ya you're right,the sai flower is a result after modifying lotus tesselation. I did some work with variable headed cranes back in 2002-2003. Your 6-sided square is just about the same as mine. 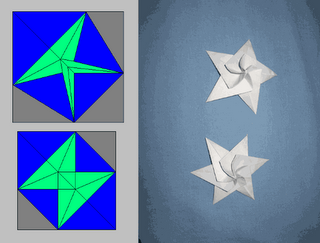 You have the "sides" arranged the same (maximal), but the internal folds are a little different. Not sure for better or worse, but definitely a little cleaner.